Looking for a healthy chicken dinner to get on the table in about 30 minutes? You came to the right place today! 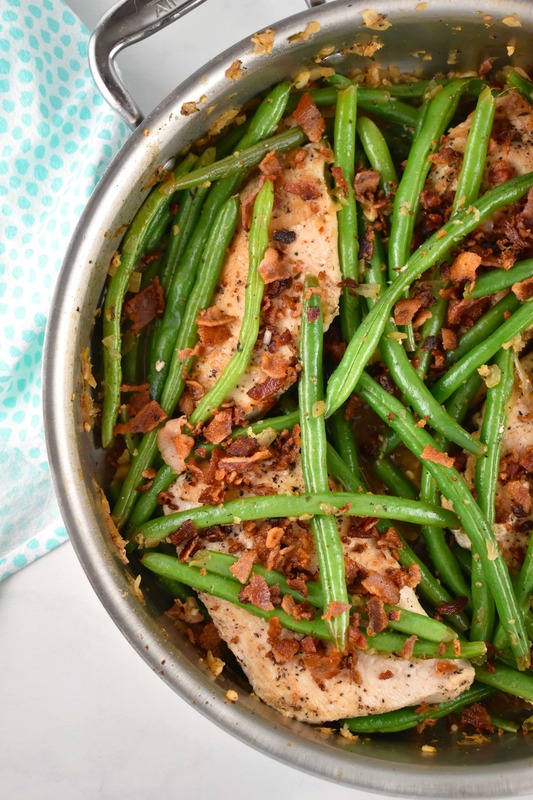 My One Pan Chicken, Green Beans, and Bacon recipe is about to blow your mind. Talk about a one-pan wonder! Occasionally, it can be challenging to get my kids to eat chicken recipes, particular those made with chicken breasts versus thighs or drumsticks. So I have to work hard to come up with really tasty ones that meet their approval (*cue eye roll here). But this recipe really does the trick. Not only do my kids (and husband) love this dish, I’m a pretty big fan too, because it’s all prepared quickly and easily in one-skillet! Other than a cutting board and knife, there’s not much to cleanup. SCORE! The bacon is what really seals the deal in this low calorie chicken recipe. 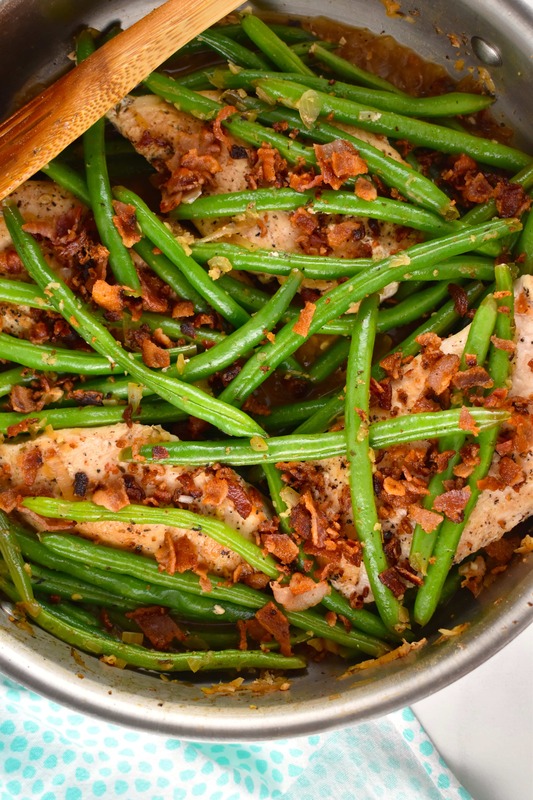 All that immaculate, salty flavor from the bacon stays in the pan, and the chicken and green beans are then sauteed in the bacon fat, along with some fresh shallots and garlic. YUM. The pan is then deglazed with white wine and a bit of chicken broth. The liquid is reduced a bit while it’s cooking itself into the tender chicken breasts, giving them an absolutely divine flavor. They just soak up all that amazing wine sauce. Sooooooo GOOD. Because my time is so limited, I’m always on the lookout for easy home cooked recipes that are not only healthy and family friendly, but also delicious. And this one pan recipe does all of that and more. 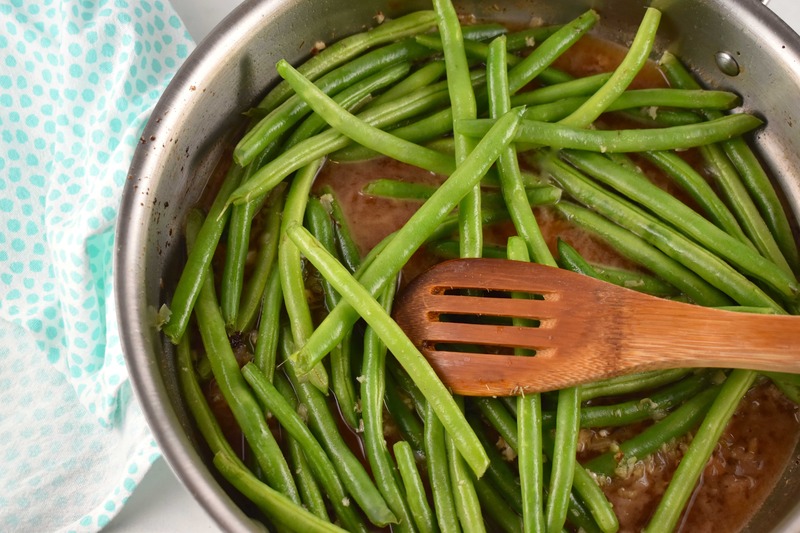 My entire family loves green beans, but if you aren’t a fan, you can easily substitute just about any other vegetable that you like. This recipe works great with asparagus, zucchini, mushroom, broccoli, spinach – there are a ton of fantastic options. So feel free to experiment and create a new version that you love! And truthfully, anything cooked in bacon is going to taste amazing. That’s a well-known fact. You can’t go wrong. You can even bulk it up and add in some potatoes or rice if you have the extra Points to spare. It’s pretty satisfying as is, but this is a great way to bulk it up and make it more of a filling meal for those folks who simply must have some carbs with their dinner. But I love trying new recipes that don’t require a lot of ingredients, don’t take a ton of prep work, and can be made in one skillet! And because chicken is a regular staple in our home, I’m always on the lookout for new chicken recipes that will be a hit with my kids and hubby. This is also another great meal prep recipe that you can add to your rotation. Lots of protein and fiber! And if you want to keep it Paleo or Keto friendly, just sub out the wine with more chicken broth. Easy peasy. Make sure to give this easy chicken recipe a try soon – you’ll be so glad you did. And it’s sure to become a regular rotation in your weekly meal plan! NEED MORE EASY CHICKEN RECIPE IDEAS? TRY THESE! 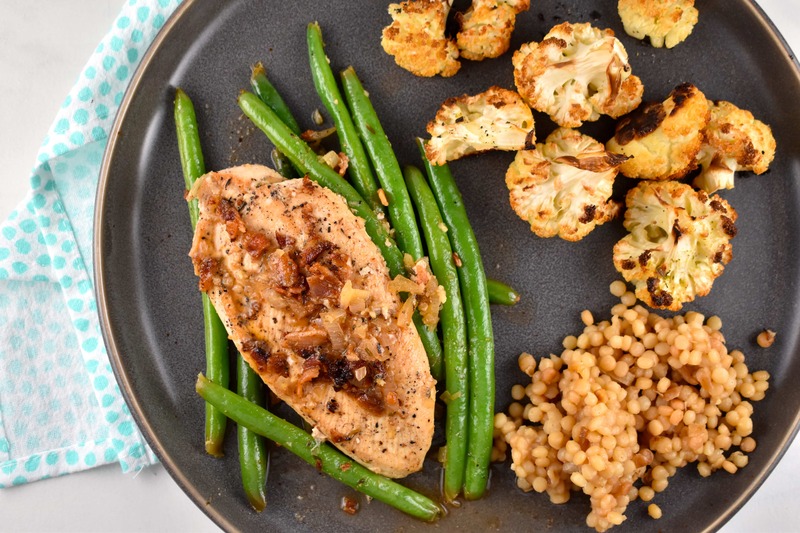 A fresh and easy dinner recipe that’s all prepared in one pan and is loaded with flavor. 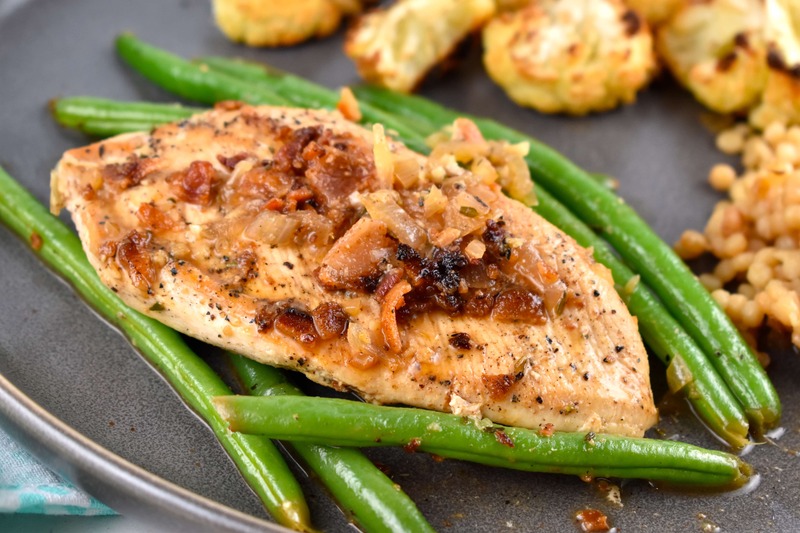 Tender, juicy chicken served with crisp green beans, and salty bacon, all sauteed in a heavenly wine sauce. Set large skillet over medium heat. When hot, add the bacon, and cook until browned and crisp, about 4-5 minutes. Transfer cooked bacon to a paper towel and set aside. Leave bacon grease in pan. Season both sides of chicken cutlets with salt and pepper. Place in to skillet, and cook about 4-5 minutes per side, depending how thick the cut is. Transfer cooked chicken to a bowl or plate and cover. Add shallots, garlic and marjoram to the pan. Saute for about 1 minute, then add the wine and broth. Turn heat up to medium high, and add in the green beans. 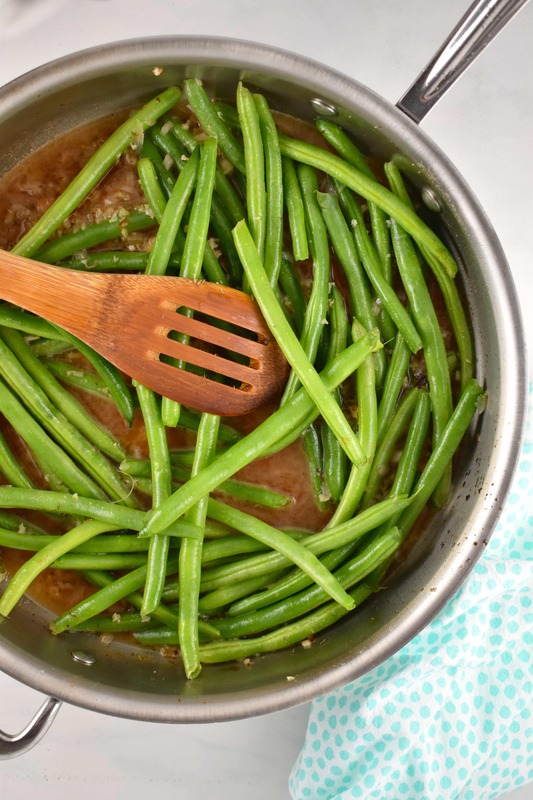 Saute for about 8-10 minutes until the green beans are crisp-tender, and the sauce has reduced. Return chicken and bacon to the pan, and gently toss to coat. Divide evenly between 4 plates, and pour any remaining sauce from the pan over each serving.